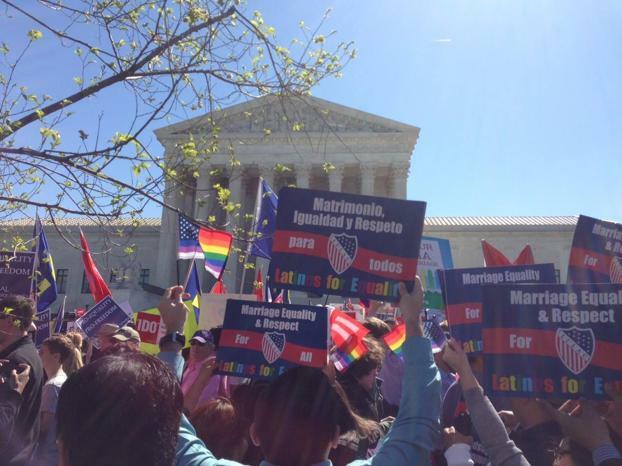 On April 28, LULAC National Staff and LULAC Lambda Members (Council #11125) joined hundreds of people rallying on the steps of the U.S. Supreme Court during oral arguments for Obergefell v. Hodges, a case that could potentially pave the way for nationwide marriage equality. Along with a variety of religious, civic, and LGBT rights organizations, LULAC forms part of the Unite for Marriage Coalition. The Coalition includes LGBT flagship organizations like Human Rights Campaign and The National LGBTQ Task Force, alongside a strong Latino contingency, including the Latino GLBT History Project, National Latina Institute for Reproductive Health, and Familia: Trans Queer Liberation Movement. I was proud to see such a strong Latino presence at the rally, but even more proud to see LULAC with the largest number of Latino supporters. LULAC has been on the forefront of advocating for LGBT rights at both the local and national level. Since 2008, LULAC National has issued member-approved resolutions supporting the repeal of Don’t Ask, Don’t Tell, endorsing a fully-inclusive Employee Non-Discrimination Act, and supporting hate crimes legislation. LULAC’s strong showing at the rally demonstrates yet another example of its unwavering support for inclusive, equitable policies for all Latinos. This support has given rise to five LGBT LULAC councils found throughout the United States. Supporting marriage equality is a natural next step for LULAC because Latino families do not fit a specific mold or fall into one category. Our families are diverse and include daughters, sons, cousins, uncles, and aunts who identify as LGBT. These family members should not face discrimination when they want to marry the person they love, and it is great to see LULAC embrace their LGBT members and commit to ensuring they receive the same civil rights protections as everyone else. Through this lens, we will move ever closer to accomplishing LULAC’s mission of advancing the economic condition, educational attainment, political influence, housing, health and civil rights of all Latinos, regardless of the labels others may utilize to divide us. Victor G. Martinez is the President of LULAC Lambda Council #11125. He is a bilingual Teacher Fellow at Mundo Verde Bilingual Public Charter School in Washington, DC. Previously, Martinez worked in education and behavioral health research at American Institutes for Research. He received his Bachelor of Arts in Sociology and Communication from the University of California- Davis, and a Master of Education in School Counseling from the University of Southern California. As a first generation Latina in the United States, I have been fortunate enough to have the opportunity to pursue a college degree in one of the most diverse universities in the country. I cannot express how proud I am of this accomplishment; knowing that I will be the first one in my family to obtain a college degree from a four-year institution. Having this opportunity is indeed a privilege many Latinos in the country do not have, due to socioeconomic issues such as high poverty rates and lacking the necessary resources to provide for a substantial and innovative education. Latinos today represent approximately 17% of the U.S. population, which translates to 54 million Latinos, yet only make up 9% of bachelor’s degrees recipients. This low rate of higher educational attainment should be a call for immediate intervention from other Latinos like me to take action and help increase the number of Latinos obtaining college degrees. I believe that having the opportunity to pursue higher education comes with a social responsibility. Education is fundamental to ensuring that everyone has an equal opportunity to succeed, but most importantly an education helps people become more socially conscientious, a transformation to which I can personally attest. My passion for education is driven by my personal background. At the age of seven my parents decided to move their family back to their native state of Oaxaca, Mexico which became my home for six years. While living in my parents' community, I noticed the lack of educational opportunities for young adults to pursue a college education not only because the nearest university was four hours away, but financially speaking, it was almost impossible to afford. I also noticed how men were more likely to pursue a college degree, while women were more likely to stay in my hometown to learn how to become housewives and eventually get married. However, due to limited financial resources, many would migrate to other cities or embark upon a journey to the United States in search of better opportunities. I knew at a young age that I wanted my future to be different, and I made it my goal to pursue a higher education in order to eventually give back to my community. At the age of thirteen I migrated back to the United States with my family, and driven by my desire, I decided to push myself academically to fulfill my dream of obtaining a college degree. I went from taking English Language Development (ELD) classes, to taking college level classes in high school, to currently being a month away from graduating from the University of California, Riverside. I cannot say I have achieved all this on my own. I have been blessed with mentors for most of my educational endeavors. Teachers, peers, and friends have guided me in achieving my educational goals because they have truly believed in my ability to succeed. Most importantly, it has been my parents' encouragement that has driven me to accomplish my dreams. Without the support network that I have had, I do not know if my educational attainment would be different. From my own experience I know that mentors and educational guidance can truly make a difference. Today I have the opportunity to intern for the League of United Latin American Citizens (LULAC), which has given me the opportunity to observe a team of dedicated individuals who incessantly work toward advancing the educational achievement rates among the Latino community. One of the many ways LULAC accomplishes this is through the implementation of various initiatives such as the Ford Driving Dreams Through Education Program, a partnership with Ford Motor Company. 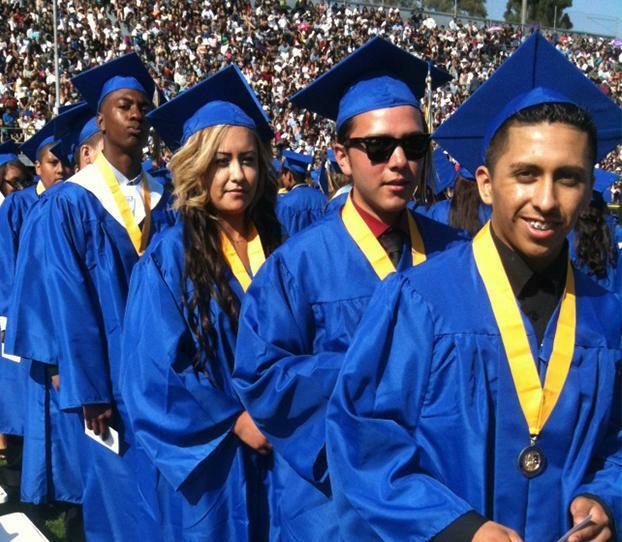 The objective of Ford Driving Dreams is to help reduce the dropout rate of Latino high school students by supporting local councils to execute local initiatives that address the educational needs of their communities. Local councils are given flexibility to design and develop their own educational programs through a variety of grant opportunities. Another LULAC initiative ¡Adelante! America Program, encourages underrepresented youth to become actively engaged in community service projects, simultaneously affording them with opportunities to develop leadership skills. LULAC’s commitment to the educational attainment of the Latino community makes me proud to intern for an organization that focuses on helping Latinos succeed in their educational endeavors. After I complete my internship with LULAC, I plan to return to my community and work as a community organizer because I firmly believe that if we organize as a community, we can influence and shape policies that positively affect Latino communities. Working at a grassroots level gives everyone the chance to become engaged and fight together for a common cause. Grassroots efforts, however, are not enough. Support must come at the policy level from Latino leaders who understand the struggles plaguing our community. In the future I would like to create a community center that focuses on providing educational resources to the Latino community that would span a variety of topics like education, immigration, and access to health care. Mary Janet Ramos is the Federal Affairs Intern for the League of United Latin American Citizens. She is currently an undergraduate student at the University of California, Riverside, where she is pursuing a Bachelor of Arts in Political Science with a concentration in International Affairs. She is also a current participant in the University of California D.C. Internship program. She aspires to open a community center in Southern California to address the needs of the Latino immigrant community.